Hey, to keep fae under control with these dubtubs, because theseam between the tubs isn't very flush, has a gap you gotta block it, like wrap it with tape. 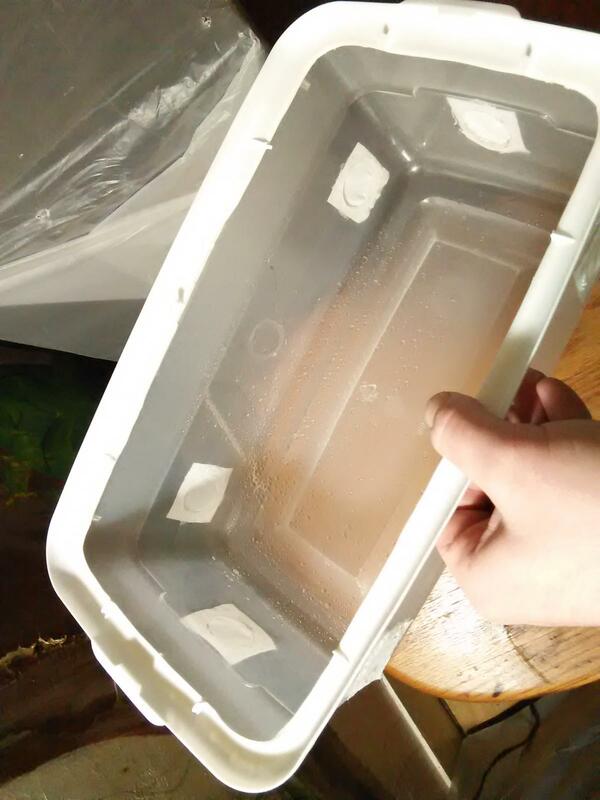 I modified mine with the lid that came with a tub( they aren't used in the setup) glued on the top tub so that it snaps onto the bottom tub like it was made that way. Cut out the center of one of the tub's lids, about an inch from the edge making a lid ring that will snap ont the tub still, leaving some of the bevelled edge that fits down into another tub, and the notches on the underside that snap the lid on. Then snap the lid-ring onto the bottom tub(like it's meant to be), and set the top tub, uppside down, onto the top of the lid. The contours will fit in the tub.Then glue the seam between the lid and top tub to make it permanent.. If you look close at the pics you'll see micropore tape around the whole thing. I am really happy with these results. 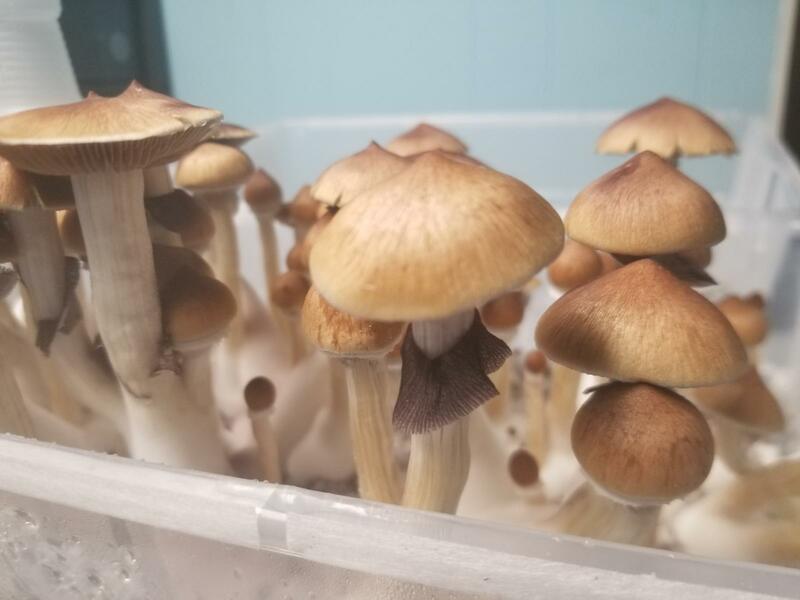 They should be ready to pick in about 12hrs. If the sub survives a dunk, and I am able to get another flush, looks like I found a good, cheap premixed bulk for the lazy folk like me. I'm obviously going to do alot more grows with this stuff. Try different strains, FCs, etc. Once I'm satisfied, maybe I'll try some strains of P. Mexicana soon, too. 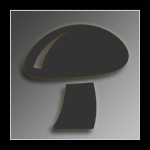 Edit...the 2nd pic is from 2 days ago, which is why they look like pins, not mushrooms. The others are from just now. Edited by Deleena24, 11 January 2019 - 01:10 PM. Deleena, How do you dunk that? 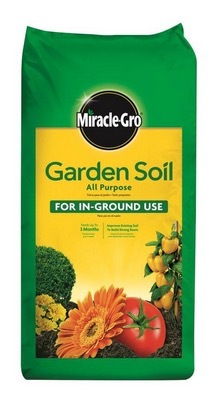 I was reading way up there ^^^ about the miracle gro perlite and that’s what I use. I didn’t know it needs rinsed. I did add salt water though. I added bleach last time. Glad to know for future reference. It was the only kind available unfortunately. The 6qt shoe box tubs, you simply fill the tub with water until it overflowing with the sub floating above the top. Then just snap the lid on. Best to do over the sink. What he said that he said. Edited by Billcoz, 12 January 2019 - 05:12 AM. 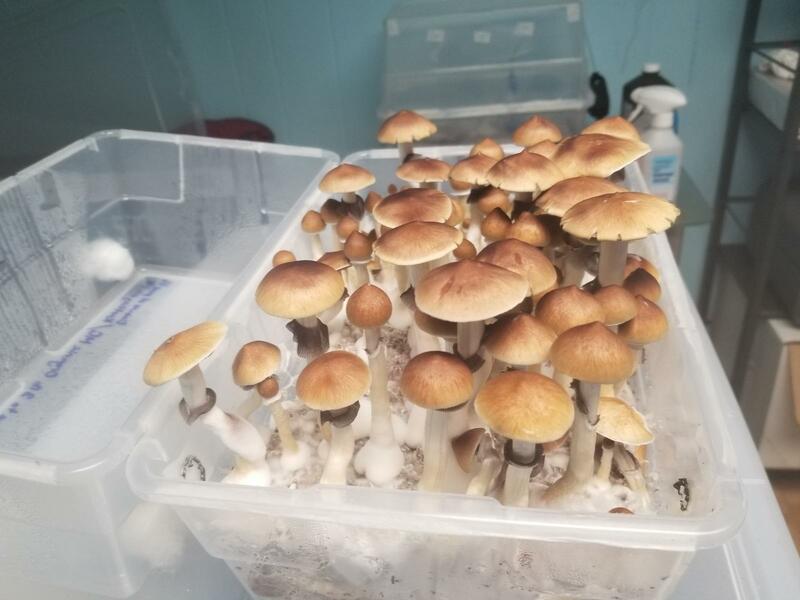 I think this is what you'd call a successful 1st flush. Heh. Very nice, D24! You truly have the magic touch with this stuff. It's quite an art and you have a great sense for it. To confirm, your dubtub was sealed from initial mixing of the substrate to harvest? 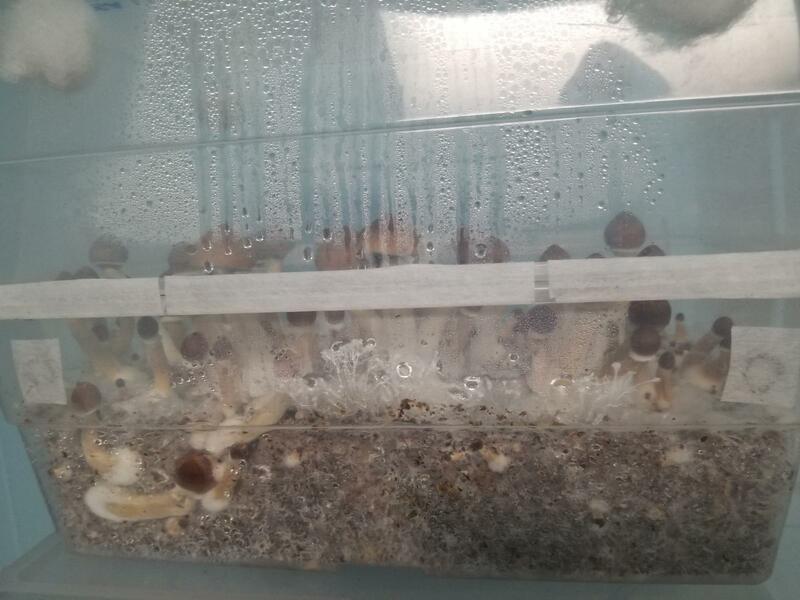 Did you do anything going from colonization to fruiting like changing room air flow or lighting (like keeping a trash bag over the dub until colonized)? Nope. I keep it simple, baby. Set and forget, nothing done to it except giving it light 12 hrs a day like everything in my growroom gets. Wanna hear something sorta cool and kind of stupid? When I scrape the extra grains and sub from the bottoms of stems, I gather them, which is the pile on the top right of that picture, put them in a PF tek jar with micropore on top, and wait. 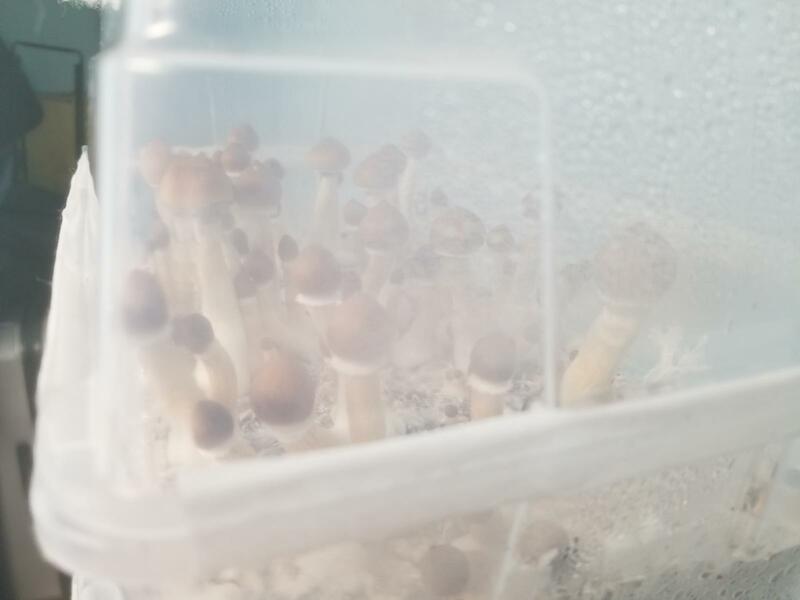 I might have to open it once to mist, but this always results in about 20 g of mushrooms, and for some reason it starts pinning within 36 hrs. I it's amazing how contam resistant colonized material really is, and how much material you can get from almost no substrate. I haven't taken pictures of these embarrassing experiments because doing this isn't recommended. It's the sorta thing you do when you are lazy and find out when you leave jars of garbage grain on a shelf and forget to throw them out....multiple times. That's awesome, how many times have you done it and has it ever contammed on you? I toss my stuff out in my garden's compost pile, and last fall I did get a few pins popping up, but then it frosted, so none ever matured. 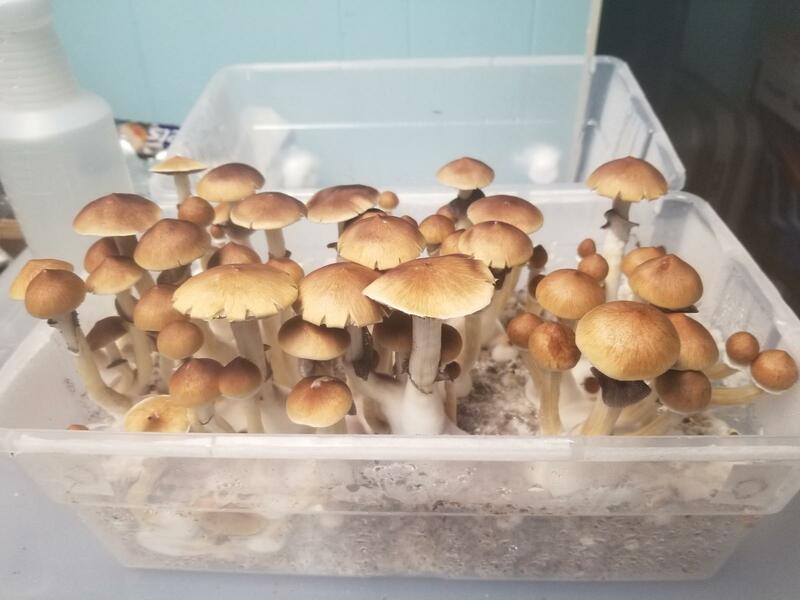 But, I was thinking if it was cold enough this winter to freeze the myc in subs/cakes I tossed out there, I might get some cubes popping up in the spring, but it's not been all that cold, so IDK. 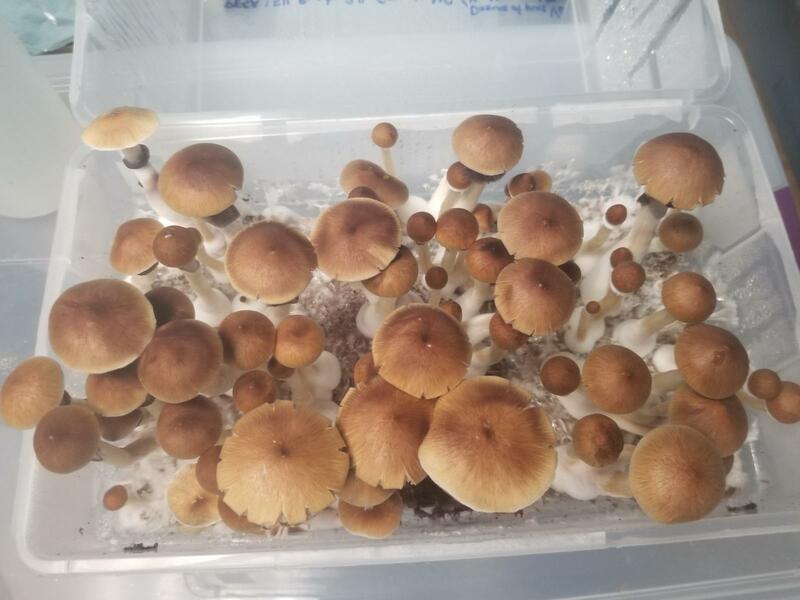 I got a crazy but what could be an insanely awesome grow that I thought of last night. I may try some variation of this but D24 would be the person who could pull it off. I bought some 2 wk ago and opened it and worked a bit with it. It's already at perfect hydration. Can barely squeeze a drop from a handful. That bag has been sitting in my laundry room for two weeks and there is no growth of contaminants that I can tell since opening. And it's hardly packed as a sterile product although I bet it has been pasteurized for stability. And we know as a sub that it can grow really well. Could one somehow noc up the entire bag in the bag it comes in? Either with a potent LC (stab it with a big syringe) or perhaps add some grain spawn (might be tough to mix well) or even MS? Then let the bag sit until colonization. 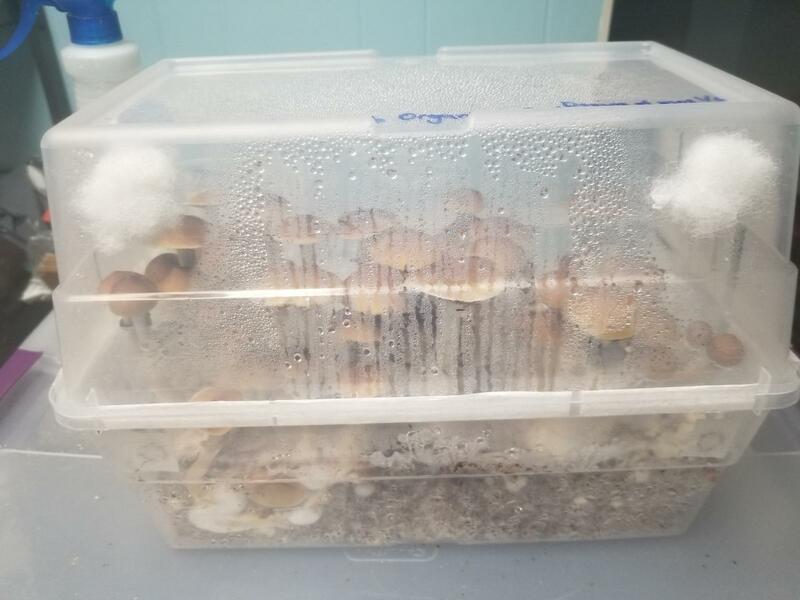 The form factor of the bag seems about perfect already for a grow at 4-5" thick considering it's over all size. Then do something clever like stab with broadheads all over the top or rip off most of the top and shift to fruiting mode. But, there is a reason we go first to spawn and then substrate. I've tried even with my best LC to noc up a substrate (thinking - why not skip a step) and it did not go well. I think it may have more to do with hydration ratios. Spawn likes to be around 50% or less while 'field hydration' (although we never talk about the actual hydration ratio) turns out to be around 68% - too wet for a spawn material. 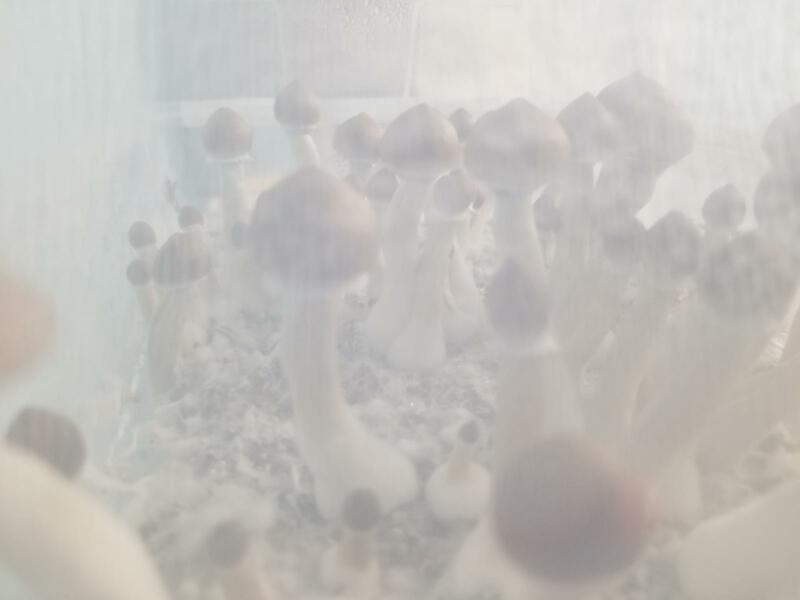 I guess that with colonization at a favorable grain spawn to substrate ratio, mycelium can endure the excess hydration of the substrate that will later give it the proper moisture for fruiting. So, maybe nix the idea of direct inoculation of the MG. Now, perhaps one could add verm or coir and gypsum or something to a separate batch of MG to bring down the hydration and start with a bit of the bag as spawn. Still making it almost a single bag technique. 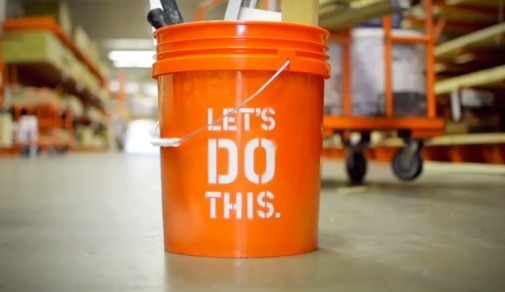 Perhaps keep it in a GH or leave it on a tarp then cover with a large inverted tub with GE patches, polyfill, whatever or even covered with a tub with a little filtered fan on a timer cut into the top. Massive magic for the masses! Edited by raymycoto, 14 January 2019 - 10:38 AM. It's funny you should mention trying to knock up a whole bag of MG. During the summer, I kept a bag of exactly that outside. 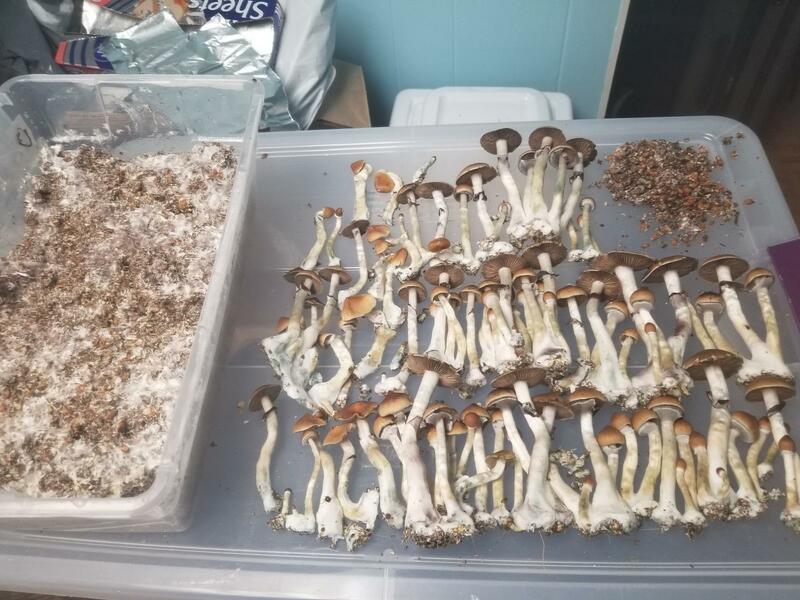 I made way too many Tampanensis LCs, so I dumped an entire half pint of LC in it, and I'd did colonize for the 2 weeks the weather allowed, but stalled when the temps dropped below 60. I asked about it in a thread here, if it would be possible to colonize a bag like that from LC. Most said it would fail, but I'm going to try when the weather warms. I'll try with cubes, both LC and grain. Why not, right? As for the jars of gathered material, I have yet to have one contam on me before I chuck it. I do it pretty much every time I harvest nowadays, so dozens of times in the last months. I do get heavy blueing, though. 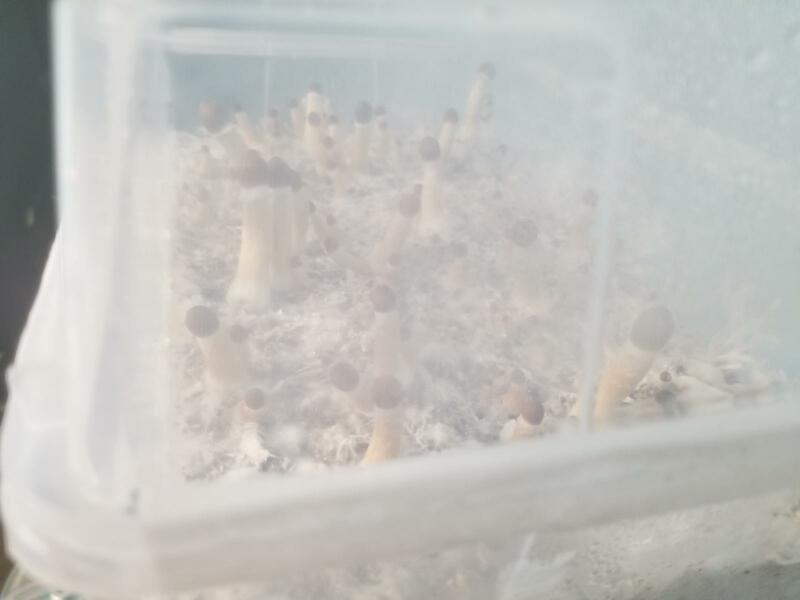 My guess as to why they pin so fast is that the mycelium is already in pinning mode. This jar had the pin appear within 24 hrs. I love experimenting. Like I said this is only going to produce like 20g wet...but it's still fun bc it was made from what most people throw away. This makes me think - What is the difference between spawn material and substrate? They are both nutrient rich. 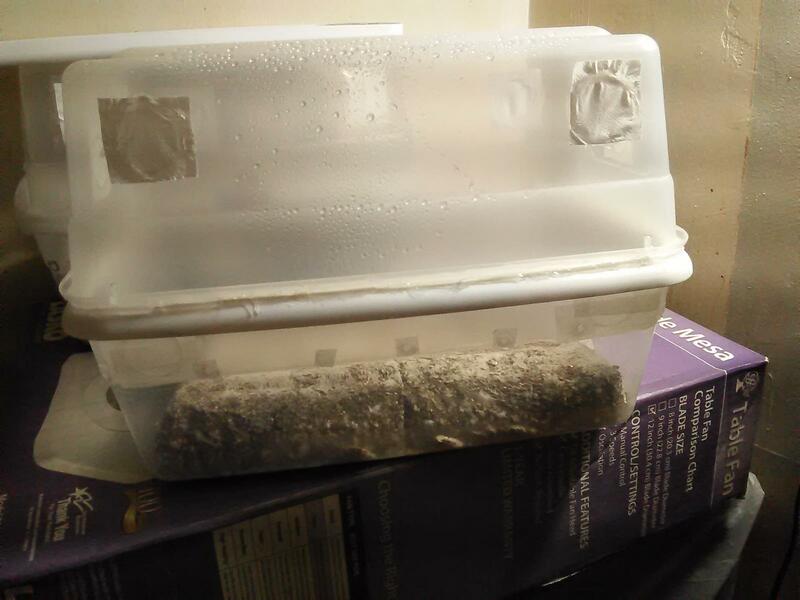 Both must have plenty of open space for GE and myc growth - grain is inherently loose with space between while bulk substrate seems to include both a relatively inert expander like coir or verm and a nutrient like poo or compost or worm casting. What I'm leading up to is this question - Is moisture content the primary difference between spawn and bulk substrate? If so, could MG mix be used for both but at different hydration ratios? That is, create a 'dryer' MG mix for spawn development then add it to the standard MG as bulk out of the bag at field hydration? Why even bother? 1) maybe just because it would be cool if it works. 2) I'm thinking of a potential tech to allow folks to get into it with minimal equipment / cost and various items. This would give 50% hydration. Could be microbial issues, but MG just sitting in the bag does not seem to contaminate. Noc with MS (maybe it would work) - I would prefer LC but I'm thinking about the simplest tech. I'll make a batch of this MG spawn recipe when I get home. And I'll noc with a known good LC. Edited by raymycoto, 14 January 2019 - 05:09 PM. I think a lot of people will disagree, but I think there is hope there with knocking up a bag or jar of it with LC. Edited by coorsmikey, 14 January 2019 - 08:13 PM. Being that a lot of these products contain fish byproducts, emulsion, etc... Does anyone have any experience with these amendments in substrate mixes? Too nutritious perhaps?